I can’t remember exactly how I heard of British author Matt Haig, but I’m fairly certain it involved Twitter and Donald Trump. I think I shared a quotation from Matt Haig on my Facebook page, something about mental illness and the stamina and bravery it requires. This was about the time Trump had given a speech to veterans and inferred that the weak got PTSD. I started and finished Haig’s book, which describes his experience with debilitating depression, on the same dreary Sunday. It was an appropriate sort of day, considering the subject matter, and I think I even read some of it while my kids were watching “The Secret of NIMH,” which was also appropriate considering NIMH stands for National Institute of Mental Health (how did I never connect this fact to that movie before?). I finished the book in one day primarily because “Reasons to Stay Alive” is compelling and blunt. I’ve struggled (luckily briefly) with depression, thanks to a rocky start with my fluoxetine along with contamination OCD, and I have to say that Haig describes it brilliantly. He paints the weight of it, the various symptoms (mental and physical), and the sheer enormity of loss and desperation you feel. Or maybe desperation isn’t quite the right word. It’s just the emptiness. The not necessarily wanting to die or commit suicide but not wanting to be alive (if being alive means feeling like that). I loved his recollections of attempting to go to the store by himself. With my background of obsessive compulsive disorder, I greatly appreciated how something that once seemed normal and everyday suddenly felt insurmountable. For Haig, it was how did I ever go to the store before? For me, it was how did I ever shower or wipe my bottom or wash my hands without worrying about contamination? Suddenly things that made up the bedrock of life seem revolutionary and inconceivable. Mental illness really screws a person up. Haig then describes his dependence upon his girlfriend and now wife, Andrea, and I was right there with him, subconsciously nodding my head in agreement at how a mental illness so often robs us of our independence. We feel that we cannot be alone. We are not safe with ourselves. We need someone there, protecting us and telling us that everything is going to be okay. Regaining our self is when we know that we are retaking ground from the mental illness. Being able to be alone and not have a panic attack is a good sign that things are looking up. But it can take so long to get back to that point. I loved his tips and ideas at how to find peace and regain your life from depression. I did, however, find it funny that on one page Haig claims to never have gone in for cognitive behavioral therapy but then later mentions how helpful it is to be uncomfortable and do the very thing that you are scared of or worried about. These are the tools of CBT, after all. Stay in the discomfort. Engage in exposures and stop yourself from withdrawing. Go against what the mental illness wants from you. It’s funny, that, and I suppose it’s a blessing from our minds during the times they are hurting us the most: sometimes we happen across the therapy or help we need in a natural way, even as a result of our own actions or thoughts. 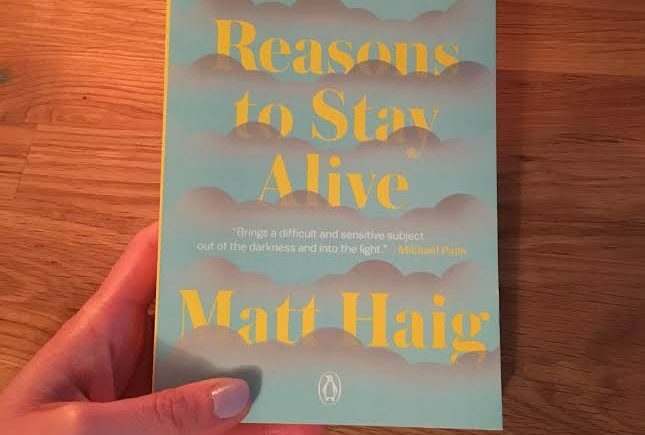 Matt Haig, of course, has not just written a book on depression. He’s written a guide for those of us who struggle with mental illness and given us hope that it’s not eternal. He even lets us know that good things can come after and because of that mental illness. Haig talks about how his initially depression-invoked increased sensitivity and enhanced thought process led him into writing, and that’s now his career. It’s hard to feel grateful, sometimes, for a mental illness. It can take years away from us and make us feel like living is nearly impossible. But it can also awaken us, maybe not immediately, but somewhere along the line. And that awakening is worth holding on for. Have you read “Reasons to Stay Alive”? Any other thoughts on the benefits or hardships of mental illness?